I can't say that I had heard much about 13 To Life by Shannon Delany before I'd read it. I only vaguely knew that it was about werewolves and that at least one of my blogging friends enjoyed it. It isn't much to go on, but I thought I would take a leap of faith and pick it up. I can't say that I enjoyed it a great deal though. While there was nothing overtly wrong about the writing style or the story, I just didn't feel very emotionally connected to any of the characters. A problem which I'm sure could be easily solved in future books with a little bit more character development. I did really enjoy the tension between Jessie, our main character, and the hot new guy, Pietr Rusakova especially at the start of the book. While Pietr immediately recieves the attention of most of the girls at school, Jessie only has eyes for her long-standing crush, Derek. But as Jessie has been assigned to be Pietr's student guide, they are thrown together quite a bit. And while it takes Jessie a bit longer to realise that she in fact attracted to Pietr, it becomes a bit too late as her best friend has already fallen for Pietr. I do appreciate that Pietr is at least a fairly nice person. He's not a bad boy at all, and while I didn't agree with his actions, I could at least believe that he felt like he was doing the right thing. 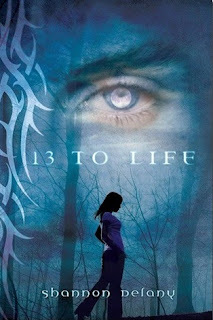 I think perhaps another problem that I had with 13 to Life is how much is going on within a very short period of time. Jessie's complicated relationship with nearly everyone together with the mystery of horrific attacks in the towns nearby as well as the arrival of Pietr and his family into Jessie's life seems all a bit too much. There seems to be a fairly slow build-up to the revelation that werewolves exist, but I feel like this could mean that the sequels to the book will be more exciting and fast-paced with the sort of set-up that has taken place in this first book. While I didn't love it, the story still kept me interested and reading to the very last page.